Korean pianist Sunwook Kim came to international recognition when he won the prestigious “Leeds International Piano Competition” in 2006 aged just 18, becoming the competition’s youngest winner for 40 years, as well as its first Asian winner. Since then, he has established a reputation as one of the finest pianists of his generation, appearing as a concerto soloist in the subscription series of many of the world’s foremost orchestras and giving recitals in leading concert halls. 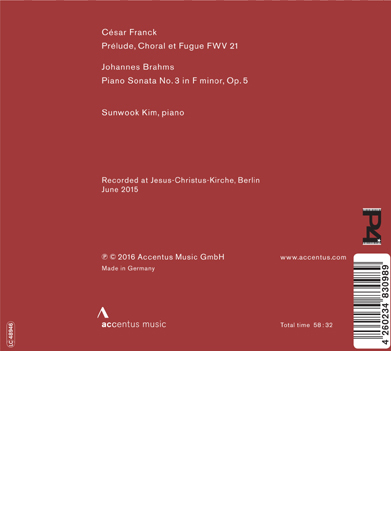 In this second Accentus Music recording Sunwook Kim compares and contrasts César Franck’s Prélude, Choral et Fugue of 1884 and Johannes Brahms’s Third Piano Sonata in F minor op. 5 of 1853. In spite of the manifest differences in their musical language, there are certain points that the Belgian composer shares with his younger German colleague: both men were pianists, both venerated the musical forms of the past, especially Bachian polyphony, and both revered the spirit of Classicism. To these qualities may be added a love of proportion and a genius for organization and well-ordered architectural structures, which are also reflected by the works presented on this CD.